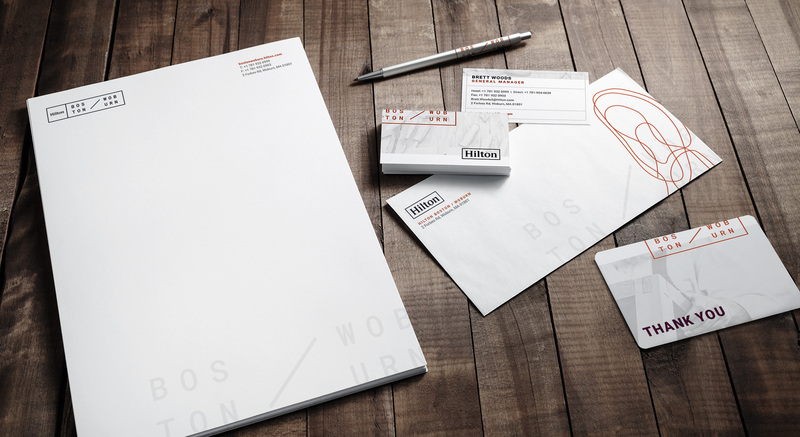 The new identity for the Hilton Boston/Woburn is inspired by the industrial history of Woburn. Even prior to its official founding, the area was known as a leather & shoe-making town – a neighborhood filled with tanners, cobblers, cordwainers, and couriers. The visual identity of the hotel plays off the creative direction established by the energetic interior realized by Jacqueline McGee and the team at Perkins + Will. Consistency across all aspects of the brand provide a truly tailored experience for guests – bound by heritage and carefully crafted to be timeless and relevant. By melding the aesthetic of local cobbler shops and tanneries with clean, contemporary lines, the revitalized Hilton Boston/Woburn embodies the core brand attributes of Genuine, Engaging, and Accommodating.